You iron one side, and flip it over only to find you've made new creases on the opposite side. It's supposed to iron with steam but it just ends up leaking all over your shirt when you're trying to rush out the door. It makes certain fabrics shiny, and you never know which ones will do it. These are problems for every guy, but when I deal with multiple outfits a day when working on Primer articles these headaches are exponential. So about six months ago I started looking for a steamer that would be quick to heat up, doesn't squirt water, and is small enough to take with me on photo shoots. As with everything, I began my search on Amazon. And in 30 seconds, I was done. I came across the PureSteam handheld steamer with over 2,800 reviews and a 4 star average rating. I ordered it and called it a win. However, I did have high expectations. Several years ago, a girlfriend of mine had a full size steamer from some place like Bed, Bath, and Beyond. That thing sputtered water and barely worked. Eventually it gave out completely. The PureSteam showed up two days later (thanks Prime!) and I immediately put it to work on set for a Live Action Getup shoot. And you know what? It worked like a charm. No, that doesn't quite convey the effectiveness. It literally ERASES wrinkles in front of your eyes. And not just “you didn't hang up your shirt right out of the dryer” wrinkles. Like “brand new shirt Grand Canyon” creases. You can wear it right away too, so you can always wear your favorite shirt. Overall, I'm very happy with it. Occasionally a small wet spot will appear, this usually only happens if I don't let the steamer fully heat up. It'll start steaming around 45-60 seconds but I like to give it a minute and half to really get going. However, these dry very quickly because they're just from the steam, not from water leaking. Since getting it six months ago, I've used it 3-4 times per week. It's perfect for refreshing an item that's still clean but has acquired a few wrinkles like a shirt or chinos. 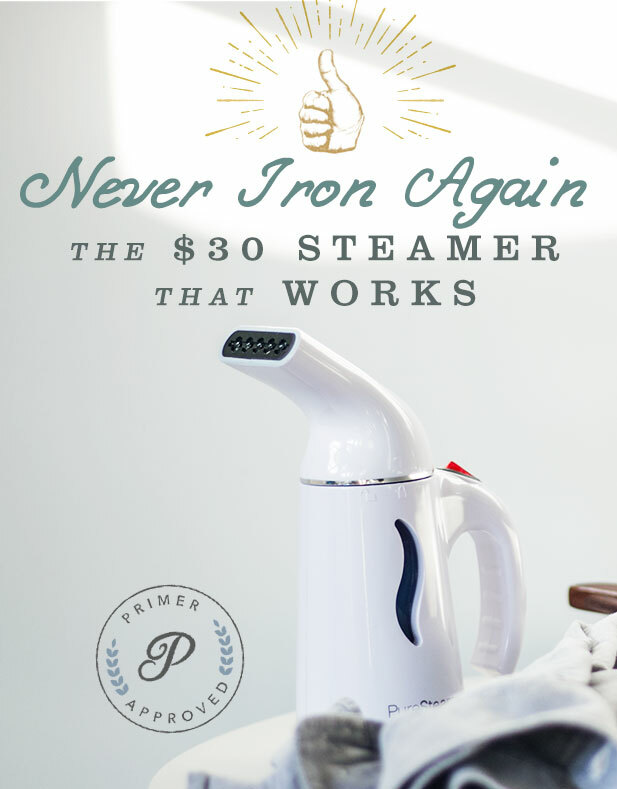 If you're a guy who wears really nice dress shirts every day and loves a super crisp collar, this steamer won't do that. But for everyone else, I think you'll love it. This is a classification for some of the products we’ve tested hands-on and feel they’re worth the money. Companies can’t pay for this distinction: The product we used must have met both the advertised promises and our expectations. And how is this faster than ironing? You must be much better at ironing than I am! Andrew, You have literally saved the day/week/month/year for me my friend. I’m a frequent visitor of this site, I love the Getups and helpful tips but this my friend is by far my most anticipated purchase thus far! I absolutely despise ironing!! As always, thanks and keep up the good work! Holy crap, sign me up! I am very interested. Currently I dry clean but I’m looking to move away from spending my money there. Any tips for using this and keep the collar crisp? would have to be iron+steam? Hey Sean, I’d say it depends on the kind of shirt. 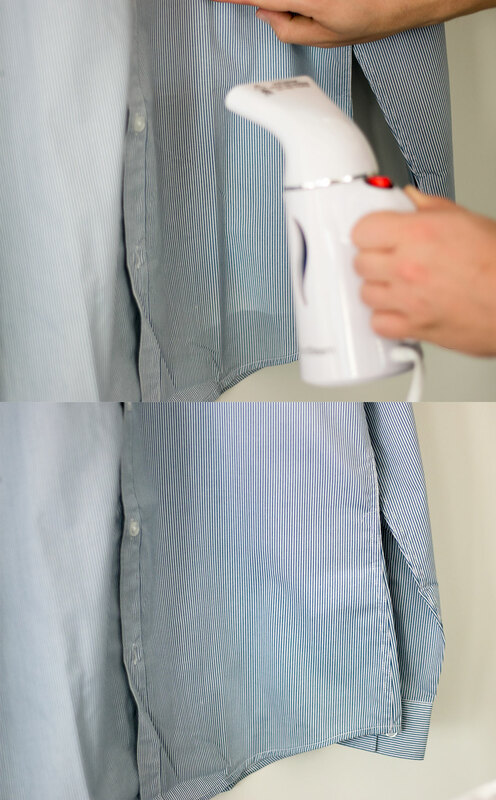 On all my shirts, casual to casual-dressy, the steamer works great on the collar. If the collar is already stiff and supported, this will take the wrinkles out. If it’s just a cloth collar like on a casual shirt, this will also work. The only thing I don’t think it will do is remove a heavy curl on a stiffer collar, but now come to think of it I don’t know if I’ve tested that. Awesome. I’m going to order one right now. Are there any clothing items or situations that don’t work as well for this (or any other) steamer? Something where it would be better to just pull out the iron? Dumb question- is it best to hang clothes while steaming, or laid on an ironing board? Just a heads up. If you order on Amazon through SKUniverse as the seller, you can use the promo code “STEAMR15” for $15 off. Nice!! How’d you find that?? Just ordered for $15. You two dudes are the best. Awesome, just picked it up as well! I used this as well, worked like a charm! Sweet! Came out to $16.11. Thank you! Awesome! Thanks for the Promo code! Just purchased, can’t wait! I bought this a few weeks ago. Funny that this is posted now. I used to iron every single day. I too had that big giant steamer. What a POS. This little thing is a beast. It keeps my suits nice and fresh and has saved me a fortune on weekly dry cleaning. IIRC, ironing is very tough on fabric. I switched over to a steamer (although not this particular model) a few months ago and highly recommend it for anyone. I work in a professional field and wear button-ups every day. I take 5 minutes each night to run the steamer over my outfit for the next day and it works perfect. Great for chinos too. I get a zen thing out of ironing. It’s one chore I don’t mind. I understand your frustrations though, Andrew. I know about that “rushing to go somewhere the iron just leaked on my shirt” thing haha. Get a Rowenta iron. I vouch for them and have no ties to the company. That being said, I think I’ll pick up one of these steamers for touch up work. Someday I’d like to get one of those pants pressers but that’ll be the day when I can burn $300 without thinking twice. Thanks for the rec! I’ll check it out. I too would love one of those pant steamers! Bought this exact steamer about a month ago. Couldn’t agree with your assesment more. I’m literally saving hours that would be spent ironing. It won’t work with thicker fabrics (chinos etc), but that’s hardly a dmaning complaint. Bought this iron a few months ago and took to a wedding in Asia. I used it for everything including the groom’s suit and my own. It worked wonderfully and i look forward to using it on my shirts/pants at home. I noticed the second button from the top is unbuttoned in the steaming demonstration. Is that part of the steaming technique? Hey Justin, nope that doesn’t help or hurt. My steamer got dropped off yesterday, annnnnd-it’s kind of addictive. I did a week’s worth of clothes in under half an hour. You have to refill it about every 2 1/2 shirts, and pants can be a pain depending on the fabric, but overall, I approve! Wish I had bought this sooner. My biggest pain with ironing is sleeves, for some reason- I can never get them to look good. This helped out a lot. Nice!!! So glad you like it too! I’ve had this same model for about a year and I absolutely love it. It takes me 2 minutes to get a shirt ready for work. It’s amazing. Looking forward to using this steamer! Q: do you need to use distilled water (like some irons recommend)? 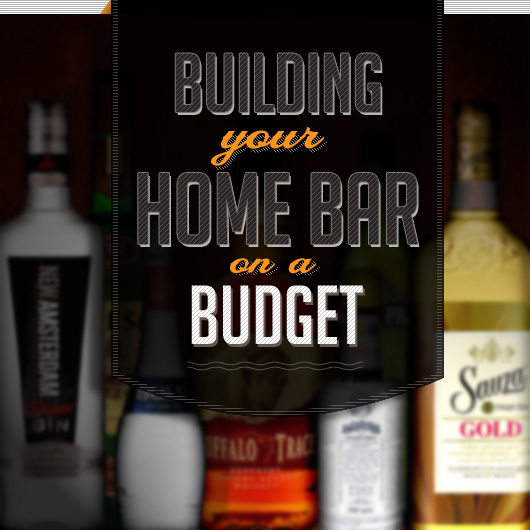 It’s not as necessary, but it will help with longevity if your area has hard water. Don’t just think this is for clothing! This will work perfectly on curtains in your house. Don’t even have to take them down. Tried it on a denim button up shirt. Not bad. Tried it on my girlfriend’s apron, ehhhhh ironing is much faster at getting that crisp finish. I’d recommend this for anything no thicker than a denim shirt or an Oxford from F&O. Interesting! I use mine on denim all the time, especially the knees. This is why i love this site. also thanks to skk0052 for sharing the great deal. So I travel for work a lot, meaning my shirts get ironed 1-2x a week. Not only is it time consuming but slowly I feel like my clothes are being damaged. I bought this 2 days ago and can’t even express the simplicity of this device! The compact size is a huge plus as I can throw it in my bag and have it at every hotel, thank you!! According to Nike’s official release calendar this colorway is being known as the Last Emperor. As you can see the Flyknit upper features Black towards the toe which then shifts to White around the ankle and on the heel. This colorway is supposed to commemorate Kobe’s past and present as well as look into his future. air max 90 black Bryant’s multiple championships, All-Star accolades and MVP honors are all embodied in this Kobe 11 which he hopes will inspire future heroes for generations to come.The Nike Kobe 11 Eulogy arrives at retailers this weekend. Another Kobe 11, another must-have colorway. Still batting 1.000.A celebration of Kobes career or a farewell, as the moniker indicates the latest Kobe 11 sports dark, rich purple and black on the Flyknit upper, Nike Zoom KD 8 offset by contrast white branding. On the right heel, Kobes two NBA jersey numbers 8 and 24 are flocked with graphics indicating the NBA titles and Finals MVPs won while wearing each.Pick up the Nike Kobe 11 Eulogy at retailers nationwide (like Sneaker Bistro) Saturday, February 27, including online accounts at 10am EST/7am PST. Heres the Eastbay.com purchase link.While previously rumored and teased, notable standouts from the extensive BHM lineup air jordan shoes black consists of the Lebron 12 BHM, KD7 BHM, Kobe 9 Elite BHM, Kyrie 1 BHM, Air Max 1 BHM, Air Jordan XX9 BHM, Air Jordan 1 BHM, Air Max 1 Ultra BHM, Air Force 1 Ultra Force BHM, Mercurial Superfly BHM and an SB Dunk Low BHM.The Duke hoops team has its very own official Kyrie 2 PE, complete with DUKE branding to celebrate its famous alumni. But if kobe high top you dont play for the Blue Devils youre not getting a pair. Thankfully, for us non-Dukies, theres the Nike Kyrie 2 Brotherhood.Also inspired by Kyrie Irvings days in Durham, but less the official branding, the Brotherhood Kyrie 2 rocks bright royal blue over the mesh upper, giving way to a black midfoot strap and white outsole. The Duke logo may be absent, but this ones Blue Devil through and through.Initially slated Kobe 9 Elite Low for a later launch, the Nike Kyrie 2 Brotherhood releases March 5.Opting to take the subtle route, the Nike Kobe 10 Elite HTM will come with a Flyknit upper done in a black and white colorway. Joining the black and white motif are the blue accents found by way of the visible Flywire as well as in the stitching on the heel pull tab. The Nike Swoosh on the kobe 9 high top side panels come in white, as does the Kobe logo on the tongue. HTM branding is placed on the heel tab of the shoe. Rounding out the look is the speckled icy translucent outsole that balance out the look of the shoe. As of right now, the shoe is only available (and for sure sold out) at NikeLab 21 Mercer in New York, but the NikeLab Instagram has let us kobe 10 high top know that this version of the Kobe 10 will soon be available at additional locations in the near future. It did not say when and where, but make sure you don’t blink because once they release they’re definitely not going to last long. Check out Lebron 13(XIII) Sale the official images above and let us know what you think about the Nike Kobe 10 Elite HTM.One of the main and only knocks on the recent Nike Kobe 10 Elite What The was the fact that Nike decided to make it a high-top for the 2nd year in a row instead of a low which is much more wearable. Picked this up in black the other day for $10 off – Amazon Lightning Deal. Would have shared, but there was less than an hour when I saw it. Works well – just make sure you keep plenty of water in it. agree so hard with this. i had a hand steamer for a while, but it was never all that convenient. but in working retail, and using a full size steamer on a regular basis, it’s exceptionally easy to never want to iron again. but this one is for real. heats up instantly. doesn’t sputter as long as you give it a proper chance to settle. and it just does its job. cord has a nice long length, which provides the mobility needed to work over a garment. and the tank is usually good enough to get through a top and bottom before refilling.